For some - squatting is the only way they know to get a piece of land. And that's just what 6 immigrant families in Belmopan did. 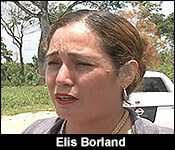 And, usually, that's the end of it - since a large part of greater Belmopan was settled through persistent squatting. But, not any more, apparently. These squatters settled in a jealously guarded reserve which is within City limits. Area residents had carved out the area Mount Pleasant Creek reserve as an important environmental buffer - and weren't about to stand by and watch it overtaken by squatters. 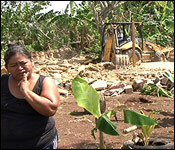 Maria Aldana looked on helplessly as city council workers demolished the foundation of her daughter's house. Later on we found her in tears - 3 months of hard work and money wrecked in one afternoon. 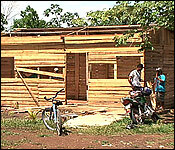 Aldana is only one of several persons whose houses are being torn down today. They have all been squatting in this area near Doyle's Delight Street in Belmopan - It is part of the Mount Pleasant Creek Reserve. The residents in the area alerted the city council because they say the squatters are defacing this reserve. 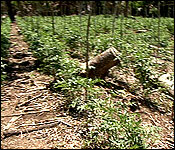 "Our issue with the catchment area, is the fact that it is a reserve, it is a pristine area, the whole neighborhood, about 8 years ago we got together as a community to try and preserve the area because it has a very important and valuable ecosystem as well as it protects the community from all kinds of damages. We have the hurricanes that came, it protected this area, we have the water that drains out naturally in the area but recently we have seen a lot of squatters building and destroying the area right beside where the water has to flow, they are cutting down all the good the trees." "We did not know to what extent, we knew that they were destroying back there because we were hearing the noise of the chainsaws but we didn't know the extent until they put a drone and they saw the clearance all the way from the top to the bottom. And if you notice down south, we did a community walk last two weeks we noticed they were doing agriculture work, I mean big big huge quantities, they were planting tomatoes and habanero more down south." So, reserve or not, these families saw this area as the perfect spot for their new homes. 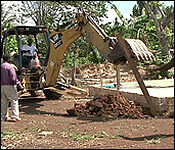 Alexander Martinez had spent one year clearing the area, building his house, planting crops and trees. He has been living here peacefully for 3 months, but then that peace was shattered when the city council sent them a 14 day eviction notice. "We received a letter that they gave us 14 days to move and that is not enough time to move because I have my family, at least 3 or 4 months to move but they just came and say hurry move because we will being the machine to bring down the house." According to the City Council, they gave the squatters more than enough time. The council sent the notice about 3 weeks ago. The deadline to move was Sunday but the council was lenient and gave the families two more days to leave. "It expired on Sunday and Monday I came out here to execute the dismantling of the buildings or for those who did not comply, and when I came out here, none of them complied so I asked them why and I tried to work with them and gave them two additional days which expired today." While the residents accept they are in the wrong, they still have to figure out what they will do next and more importantly where will they live. That is why they are asking the city council to accommodate them. "I know a lot of people squat but you know it is illegal." "But why didn't they move the other people that do the same thing, squat? Only us they move the rich people push the government to move us from here because they don't want poor people close to the rich people." "But when we spoke to some of the residents they said this is a catchment area, it is not to let anyone live , it is not about poor or rich, it is a catchment area, reserved." "Yes we agree with that but at least give we land, we will pay for the land we are not asking for it for free because no one can get it free we could pay for it." 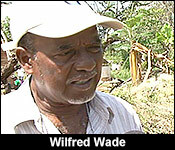 "We are Belizeans too we need a piece of land." But the city council says regardless of their citizenship, no one can just squat anywhere they please and certainly the city council won't find land for them. They are pretty much on their own. "The city council is not under any obligation to find new lands for them." "What I do know is rent is a problem for them and I understand, I know a number of them are underemployed so they want a piece of land so I understand but you can't go around squatting because it will create chaos." A tough and costly lesson learnt for these squatters. Area residents say that going forward they will be very vigilant to make sure no squatters settle in the area.